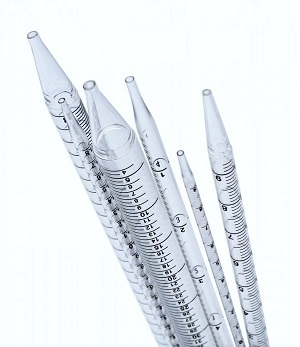 A Serological pipette is designed for accurate and rapid fluid dispensing. 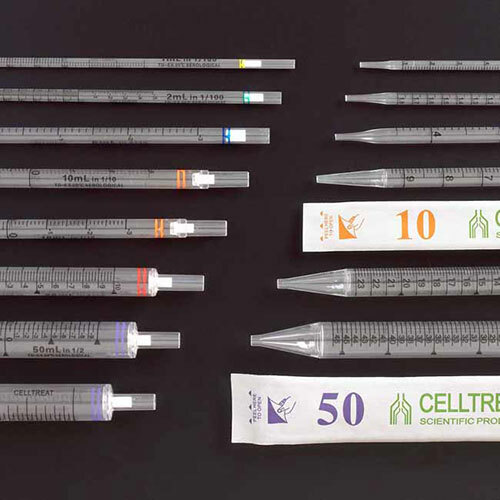 A Serological pipette is usually packaged sterile (sometimes individually), pyrogen-free, cotton plugged, and can be used for a variety of liquid handling applications. They are disposable and have graduation marks along the sides for measurement of the liquid to be aspirated and dispensed. Serological pipettes are a nearly ubiquitous piece of laboratory equipment used in most labs around the world, and they are particularly useful in the areas of tissue culture. Designed for accurate and rapid fluid dispensing, serological pipette that are sterile, pyrogen-free, cotton plugged, and can be used for a variety of liquid handling applications (certified DNase/RNase free). They are manufactured from transparent medical grade polystyrene and sterilized by gamma radiation. Each Capp Serological Pipette is equipped with an innovative filter plug which prevents overflow of liquid into the pipette controller. Ranging in volume from 1ml to 100ml these Serological Pipettes are an ideal substitute for BD Falcon, Greiner Bio One, Axygen and other brand names without sacrificing quality. Ascending and descending graduations on all pipettes larger than 1ML. Traditional serological pipets have a straight cylindrical shape vs. the Wobble-not, which has a two-tiered step design which helps to decrease insertion force, while increasing pipet stability in your controller. You will feel better, and work smarter. No more jamming your serological pipet into your pipette controller. Achieve maximum stability (no wobble) and less dripping with the revolutionary design. Traditional serological pipets have a straight cylindrical shape vs. the VistaLab Wobble-Not Serological Pipette, which has a two-tiered step design which helps to decrease insertion force, while increasing pipet stability in your controller. You will feel better, and work smarter. No more jamming your serological pipet into your pipette controller. Achieve maximum stability (no wobble) and less dripping with the revolutionary design.